I haven’t yet put up a chili recipe. I don’t have one that I love enough to stick with, but rather make it up as I go along. I almost always put a bottle of Mexican beer, a few ounces of tequila, and a couple of tablespoons of unsweetened cocoa in my chilis. But I found this recipe on a website dedicated to the late crime novelist, John D. MacDonald, whose Travis McGee series I am currently in the middle of reading. For those who are interested, MacDonald’s Travis McGee is about the best serial character I’ve run across in mystery fiction–I’ve come to like him more than Spenser or Jesse Stone, Robert B. Parker’s crime heroes. If you’re interested, check out http://www.home.earthlink.net/~rufener/, and read through the site. If you like hard-boiled crime fiction, this is some of the best. Travis McGee’s best friend and next-boat-berth neighbor is Meyer, a renowned economist and goldmine of knowledge and insight. With these two characters, the author manages to find a way to say whatever he wants about humankind and the state of the world. When the urge came upon Meyer he would create a pot of his famous tears-and-gasps-inducing house specialty. It was said to be never the same twice, and not for the faint of palate. Since MacDonald gave us neither a recipe nor helpful hints, we’ll have to make some reasonable assumptions, just as Meyer himself would do in other situations when there were knowledge gaps to be plugged with logical guesses. 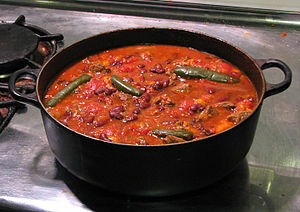 There are many versions of Proper Chili, depending on which fanatic is holding forth. Meyer’s chili philosophy would probably favor the relaxed and practical approach – concoct something plentiful and tasty from cheap available ingredients. Never mind those chili-competition semi-pros with their theological arguments over The Current Culinarily Correct Ingredients, such as: “are beans permissible?”, “are tomatoes taboo?”, or, “must the meat be hand cut instead of ground?” and so on. We are not sure how Chili Con Carne originated, but of the several theories, here is the one that would probably sound right to Meyer. On those long-ago cattle drives to the distant railhead, there would be a chuckwagon with a Mexican cook. They’d select one of the animals and butcher it to feed the crew. Then they would eat their way through the carcass day after day. As the better parts were consumed, the remainder got covered with herbs and spices to keep the flies off and prevent mold. Nearing the end of the trail, there would be just funny little ends of meat left, and of course dried beans and onions and chiles, and all of this went into the pot to make the final meals. Here is the sort of recipe Meyer might have carried around in his head, ready to be put to use in the galley of his cabin cruiser. First, get out a big pot with a lid. It ought to be heavy cast-iron for both browning and simmering, and ideally the iron should be porcelain-coated. The coating prevents rust while the chili rests overnight, as all good chilis should, to mellow the flavors. If there is room on the galley stove for a second pot, you can cook your own beans and add them whenever they’re done, otherwise canned ones will have to do. Now for the formula (all measurements are casual). After cooking, refrigerate overnight, remove hardened fat, and reheat. Chili is good with toasted garlic bread or warm tortillas. It’s even better with guacamole accompanied by veggie dippers and corn chips. WARNING: Do not use kidney beans or tomato soup! These are the trademark of the school cafeteria cook! Also, for the customers who don’t think it’s fiery enough, set out Mexican hot sauce, not Tabasco.